Shogunate executioner Ogami Itto is framed as a traitor by the agents from a rival clan. With his wife murdered and with an infant son to protect, Ogami chooses the path of the ronin, the masterless samurai. 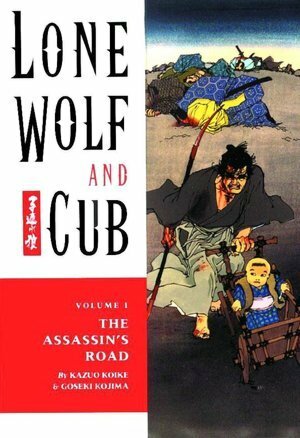 The Lone Wolf and Cub wander feudal Japan, Ogami’s sword for hire, but all roads will lead them to a single destination: vengeance. This is the first manga I’ve ever read. I saw it in the library, so I decided to give it a whirl. I’m going to keep this relatively short. The art was well done. I liked the black-and-white art style present in most of the novel. The plot was… I’m not really sure. It opened in-media-res, which means a very cold open into the middle of action. It makes it difficult to understand what’s going on. I’m missing a lot of cultural context behind this, as this is set in the shogunate of pre-modern Japan. More, the narrator gave us a TON of Japanese names to memorize for future installments of this manga, which was a bit much. I seem to think that the little kid is the son of a famous executioner who is slain in battle, while his adoptive father is a wandering ronin who wants to… something. His motives could have been explained better. I liked the bad guys. They were weird shapeshifting ninjas who wanted to kill the adopted son.